The Corporate Accountability Working Group of ESCR-Net (CAWG) participated today in the opening of the third session of the IGWG, taking place this week in Geneva. 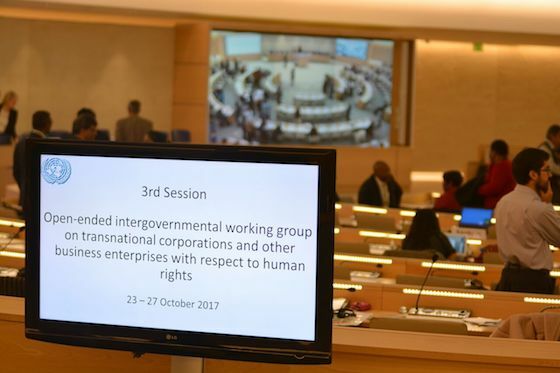 Following election of the Ecuadorian Ambassador as IGWG chair-rapporteur, states adopted the program of work, after ultimately deciding against adding a footnote making it explicit that discussions encompass all business enterprises rather only transnational corporations. This was decided with the acknowledgement that the scope of the treaty would be discussed during the session, and state positions would be reflected in the session report. In parallel, the Treaty Alliance (TA) press conference took place at the UN Square, launching a week of mobilization and the current TA statement. Many members, including three as panelists, and others participated in a lunchtime side event called ‘Mind the Gap: A Feminist Approach to the Binding Treaty’. In the afternoon session, states and civil society groups made oral statements outlining key issues for the session and in ongoing negotiations. Elizabeth Kariuki from the Kenyan Human Rights Commission delivered CAWG’s opening statement, and members Al-Haq, AWID, FIAN and the Legal Resources Centre also made statements. CAWG’s statement stressed our commitment to an ongoing process and our encouragement for states to work towards a draft text in 2018. After welcoming the recognition of the primacy of human rights over trade and investment interests, we outlined several key ways to strengthen the draft elements, namely: (1) incorporating a gender-responsive perspective throughout the corporate accountability framework; (2) establishing a clear framework to address the conflict of interest that often exists between corporate profit motivations and human rights and environmental standards; and (3) the need for positive measures with respect to human rights defenders, to not only protect them when they are targeted, but also to create an enabling environment to support their essential work. After a short discussion on the UN Guiding Principles, the IGWG began its substantive discussion of the draft elements. The day concluded with a meeting with the Ecuadorian Minister of Foreign Affairs, Ms. Maria Fernanda Espinosa, where civil society groups discussed the day’s events and considered opportunities to progress negotiations constructively. IGWG program of work: general framework (cont.) (preamble, principles, purpose, objectives); general obligations (obligations of states, corporations, and international organizations). Side event - Depth of the treaty on business and human rights: overcoming some challenges in defining the corporate entities covered by the treaty. 1:30-3pm at Room XXII.